Most people are surprised to learn that the soap they have been using their entire lives is really not soap at all. Commercially made soap is actually synthetic detergent with a petroleum base which is stripped of the natural skin moisturizer, glycerin, during the manufacturing process. It is typically made in large, overseas factories using the most low-cost ingredients available. Detergent soap cleans well, but robs skin of its natural oils, leaving it dry and itchy. 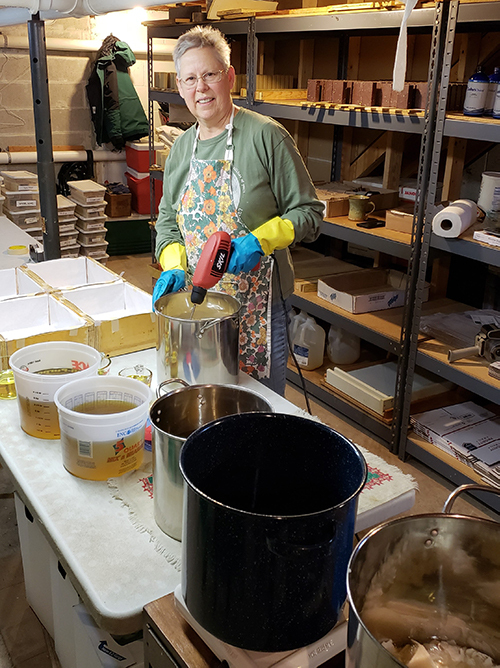 We carefully handcraft our soap in small batches from high quality vegetable and fragrance oils containing no animal fats or artificial colorings. Each of our bars is pure, true soap. All of our soap is made using the "cold process method" to retain all the natural glycerin that helps the skin retain moisture after bathing. Soap was originally made by mixing rendered animal fat (tallow), water, and lye leached from wood ash. It was a long, arduous, odorous process but did produce real soap, i.e. made with natural materials. Our soap is also real soap, but we use vegetable oil instead of animal fat. Soap cannot be made without sodium hydroxide, which when added to water, becomes lye. When combined, the oils and lye are transformed into soap and glycerin. There is no lye remaining in the soap once the chemical reaction (called "saponification", meaning "the making of the soap") between the oils and lye is completed, resulting in a mild bar of soap. We use food-quality natural ingredients to make our soap, adding fragrance oils to give them their unique scent. Each of the oils we use has its own special properties. Olive oil is a very mild oil that cleans well and is an excellent moisturizer. We use coconut oil for its sudsy lather, moisturizing properties, and hard bar of soap it produces. Palm kernel oil also produces a nice hard soap which is mild and cleans well. Castor oil is another moisturizer, lending itself well to soap, shampoo, and various other skin-care products. When you use our handcrafted soap, you know it was made with our own personal touch. We hope you enjoy using Star Lake Soap!